Japan consists of several thousands of islands, of which Honshu, Hokkaido, Kyushu and Shikoku are the four largest. Japan's closest neighbors are Korea, Russia and China. The Sea of Japan separates the Asian continent from the Japanese archipelago. 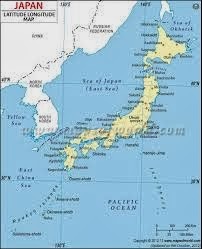 Japan's area is comparable to that of Germany or California. Japan's northernmost islands are located on a similar geographical latitude as Milan or Portland, while her southernmost islands are on a similar latitude as the Bahamas. More than 50% of the country is mountainous and covered by forests. Japan is politically structured into 8 regions and 47 prefectures. The population of Japan is about 125,000,000, including approximately two million foreign residents. More than half of the non Japanese population is of Korean descent. Because Japan is located in a region, where several continental plates meet, the country experiences frequent earthquakes. Please visit the special page about earthquakes. For the same reason, there are many volcanos in Japan. Japan's most famous volcano and highest mountain is Mt.Fuji. Due to the large North South extension of the country, the climate varies strongly in different regions. The climate in most of the major cities, including Tokyo, is temperate to subtropic and consists of four seasons. The winter is mild and the summer is hot and humid. There is a rainy season in early summer, and typhoons hit parts of the country every year during late summer. The climate of the northern island of Hokkaido and the Sea of Japan coast is colder, and snow falls in large amounts. In Okinawa, on the other hand, the mean temperature of January is a warm 17 degrees Celsius..